With the minimum turning radius about 30% less than that of the MB type, the MC type spins well, enabling you to mow the grass around the trunks and make a U-turn at the edge of the field with comfort. With the minimum turning radius about 30% less than that of the MB type, the MC type spins well, enabling you to mow the grass around the trunks and make a U-turn at the edge of the field with comfort. When operating at a low speed, this machine can spin at the same position. Therefore, you can make a U-turn at the edge of the field or in a small area without turning the steering wheel quickly in alternate directions. Gas springs are used to reduce the force required to operate the lever. An HST pedal that operates with a light force is used to switch between driving forward and backward and control the speed. The brake is activated automatically when you release your foot from the pedal. *The throttle, choke and HST pedal are located near the steering wheel so that the levers are not easily caught by branches for enhanced workability. 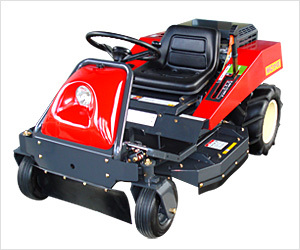 * Mowing part is covered to make it easier to clean the machine. *The specification may be revised for improvement without notice.